If the French language and yoga are two of your favorite things, this article is especially for you. 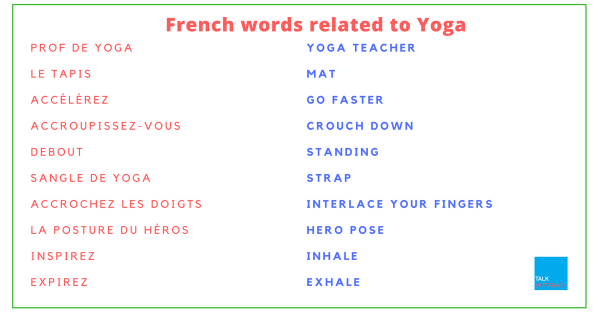 Here are some French words and phrases that you’ll find quite helpful when doing yoga. Whether you’re in a French-speaking destination and wish to join a yoga class or simply trying to incorporate the French language in your daily activities, this list will provide you with the French equivalents of words that you’ll hear in yoga class. The list includes the equipment, exercises, as well as some yoga poses. Not only that, you’ll also get a list of vocabulary related to body parts. So what are you waiting for? Here’s your list of words. So there you go. If you need a pdf copy of this list so you can save it on your phone or print a hardcopy, you can download the pdf file when you sign up to join the mailing list. Plus, you’ll get loads of other free resources when you do!